Having received the ECHO Klassik Award for ‘Best Newcomer’ in 2006, Linus Roth received a second in 2017 for his recording of the Shostakovich and Tchaikovsky violin concertos with the London Symphony Orchestra. He has played as a soloist with world-class orchestras across Europe, and pursues a busy career as an international soloist and chamber musician. Linus has made a name for himself internationally with both established repertoire and his (re)discovery of undeservedly obscure works, having devoted special attention to works by Mieczysław Weinberg. His recording of Weinberg’s complete works for violin and piano was followed by albums of Weinberg’s Violin Concerto in G minor and Concertino; both CDs were selected as ‘Editor’s Choice’ by Gramophone. Raising awareness of Weinberg’s works is also the aim of the International Weinberg Society, founded by Linus in 2015. Linus studied with Professors Nicolas Chumachenco and Zakhar Bron before pursuing his studies with Professor Ana Chumachenco, one of his greatest influences, at the Zurich and Munich conservatories. During his studies he was a scholarship holder of the Anne-Sophie Mutter Foundation. 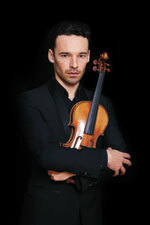 In October 2012, Linus was appointed as professor of violin at the Leopold-Mozart-Zentrum. Linus Roth plays the A Stradivari ‘Dancla’ 1703, kindly lent by the L-Bank, Staatsbank of Baden-Württemberg, Germany. Linus spends his free time enjoying fitness sports, gourmet restaurants, and sailing around his favourite island, Ibiza, where he founded the annual Ibiza Concerts festival.